Well, actually, the snail is in a little basin, under water, gently nibbling algae while wandering over pebbles and larger rocks. The snail is black and white, about the size of a quarter, and when it pokes out its eyestalks to look through the watery contained world I am unreasonably charmed. I am easily amused, and oddly trusting. These traits I think are inborn, like my twinned toes and my blue green eyes; I don't take credit for them, but they get me by. Yeah, even the odd toes, which used to make me assume I was meant to be a mermaid somewhere. Above the little basin in which the snail and a few little fish live, an orb spider has been building a web. When I go to check on the fish and admire the snail I always look for the spider as well, and usually she is there, mid web, waiting, noiseless and patient. When the web tears and I think she is gone--the next morning brings a new web. Renewed, beautiful, perfect. Sometimes frogs visit. A family of little salamanders lives deeper in the recess above the basin. All's well with the world. The lark may not be on the wing--the only larks I've seen here are closer to the river, in the wild vast meadows by the river, meadowlarks who rise up singing and fall again--but across the way there are woodpeckers, and ravens who come perch on the still blank sign that someday is supposed to say Books and lure all wanderers in. And little sparrows. We walked in the meadows yesterday, my partner and my youngest, down in the lands put aside for a park, down by the river where the community farm grows greens and radishes and the fields are harvested for hay. It's an old ranch, many acres of flat land in an embrace of hillsides. The river is across the road. The river is much too low this year of drought. But the meadows stretch on, and the song sparrows and bluejays and birds I can't name and can barely see as they flit from shadow to sun--all those are there. We went to the labyrinth. My partner expected something grand--I think he envisioned a formal shrubbery maze, not the simple pattern of laid stone and gravel circling to the core and out again. My son lit up and made signs in the air and great bowings and dancings. My son loves spaces that have--I don't know. Something simple, something holy in them. And I think this little labyrinth does. 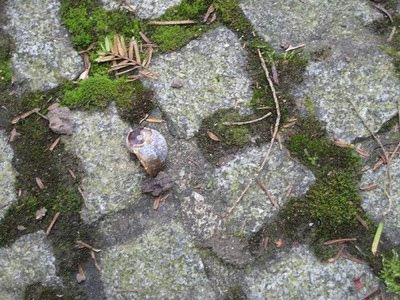 It winds, I reflected, as I walked it while my partner and son laughed at me, at the indirectness, the going and coming--something in the same way the little watersnail's shell does, upward to the center, downward to the edge. As you walk it you can look up and see the sky, you can see the turns of the hills, you can see the curious deer as they bound away, and the birds. It's a heart pattern, somehow, by which I mean that the walking of it seems in tune with the beat of one's heart, which seems in tune with the wind in the trees, which seems in tune with...well, with the whole wheeling universe. The time I was there before this was at the end of construction, when I was called on to come help with the gravel and the cleanup while the sun blazed in the sky, a few days before the dedication ceremony. I was unable to attend the grand opening, and I was actually glad of it in a way. I sent my good wishes and my blessings, the group did assorted neoCeltic ceremonies, power was called down--I was told it was wonderful; I was celebrating Father's Day with my dear and our assorted children, who came by with stories and treats in an unplanned row--my eldest son and his partner with wine (and where is our corkscrew? ), my daughter and her partner with cake and trinkets, and my youngest--always here, at the last with his carefully chosen gifts: a handful of dinosaurs, a flashlight that makes noises, a shiny pocket knife. It was also the anniversary of our bookstore, opened with a handful of boards and a trailer's worth of books in a long ago burnt down building, 28 years in the past, but we simply marked that by staring at each other in wonder. Actually, my partner scoffs at 28 years. Too soon to celebrate, he says. Now, 38 years--that would be something. And I laugh. And I try to focus back to the present moment, where joy lives. Flickering perhaps. Sometimes seeming gone. Ever returning, this core where all's right with the beautiful world, despite all I know, all I grieve, all I love. Or because of that.